For the March gathering of the First Central Book Club, we read Michael W. Twitty’s The Cooking Gene. The book is both memoir and exploration of the foodways of Southern cooking—how the history of the food reveals a complex mix of cultures. The food is a way to reflect upon the racial history of the nation and a way to discover African American contributions to our culture. Reading the book has inspired me to think about the food history of my own family. One of my family’s food traditions is fixing black-eyed peas for good luck on New Year’s Day. Reading Twitty’s book, I was surprised and excited to learn the African roots of a tradition my very white Oklahoma family practiced. Since reading Twitty’s book, I have tried to explain foodways and cultural connections to Sebastian while we are working in the kitchen. 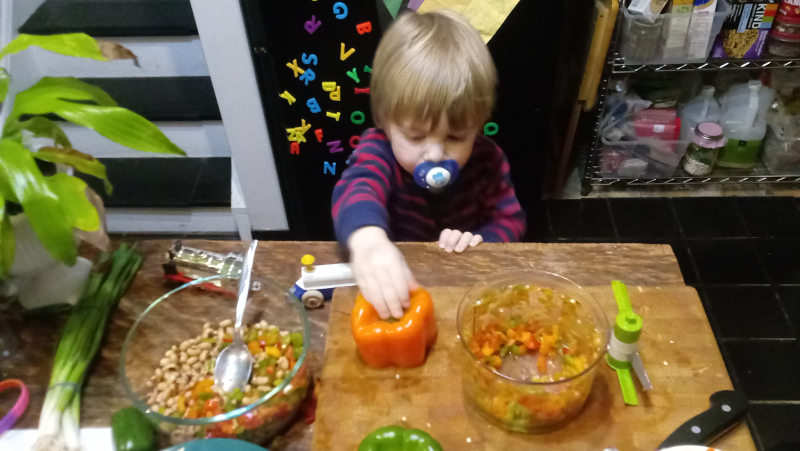 I have always used this as time to teach him about food and good kitchen skills, but I have now added this element of culture and also a time to tell stories of my life and our family. Last week we prepared Texas Caviar, a black-eyed pea based dip I first encountered at parties. As Sebastian and I worked together in the kitchen, I talked about the fusion of sources in this recipe: black-eyed peas from African roots, peppers from indigenous American cultures, the garlic which is more European, along with the olive oil. The rice vinegar might come from many traditions that cooked with rice, but the rice vinegar in our house is because of the Asian influence through my mother-in-law. Finally, there’s the tortilla chip with which to eat the dip and which comes from Hispano-Indian culture. Reading Twitty’s book has opened up meal preparation to this sense of rich story and history and cultural mixing.